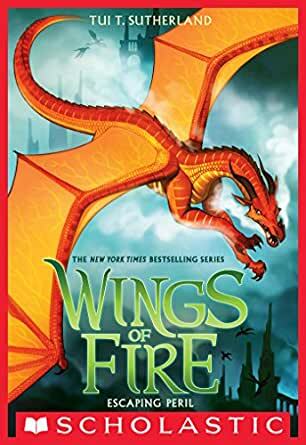 "The New York Times and USA Today bestselling series soars to even greater heights with a new prophecy and five new dragonets ready to claim their destiny! So when she's offered a chance to trade everything for a second chance, Peril has to decide who she's really loyal to . . . and whether her own scales might actually be worth saving." If you want to read the book, it is the BEST BOOK EVER! (except for the Darkmess of Dragons, book 10 of the series)! How Scarlet and Soar enchanted Peril and made her forget about Clay. When Peril said "Who's Clay? ", I was just like "OK then, doesn't seem like normal behaviour. Maybe the necklace had something on it..?" And also how she was suddenly Scarlet's BFF again, I was really just like, "Take off the necklace, Peril!" Anyway, this book is a must read, as are all the other books in the series. 5.0 out of 5 starsGO PERIL!!!!! Its really hard not to feel sorry for peril. No family, mostly eveeybody hates her, she literally can't touch anything, scarlet (BOOOOOO) tricked her and made her kill people and when she finds her dad, it turns out he's a massive jerk. I love peril and I'm so happy she got her own book. WAY TO GO PERIL!!!! Seriously though, her dad is the worst. ever. EVER. escaping peril is probably the best book in the series it revels the skywings secrets and wether Queen Scarlet is alive or not. this book is sure to keep you reading untill the end! Warning! this book contains cliffhangers. Escaping Peril is amazing! It brings the "zing" to "ama". I feel so sorry for Peril and everyone should get a second chance right? She only killed for Scarlet. Boo Scarlet! I love this book you should to! She must be so sad that her father tricled her and stuff. So yay Peril, boo Cameleon and boo Scarlet.